According to the old cliché, the definition of madness is doing the same thing over and over again and expecting different results. And so, while Chris Ashton's first start for England since 2014 may be the headline news from today's announcement of the England squad to take on the All Blacks on Saturday, it is the selection of two second rows on the England bench, to the exclusion of the excellent Zach Mercer, that is the biggest cause for concern. 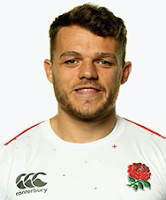 I would have had Mercer - playing out of his skin this season - starting at number 8, but his entire omission from the matchday squad means that England will have no proper back row cover on Saturday, with either one of Courtney Lawes or Maro Itoje probably having to fill in at flanker if required. Let's be clear, Lawes/Itoje at flanker has never worked previously for England and there's absolutely nothing to suggest that it will be successful this time against what is probably the most effective back row trio in world rugby. I had hoped that Eddie Jones might have learned from previous experience. It seems I was mistaken.